Every child eventually learns to use the potty. Every parent survives and moves onto a zillion other parenting successes. Somehow though, until success is guaranteed, the potty experience has the potential to throw calm, competent parents and kids over the edge. Potty training presents unique challenges to parents and to children because it requires trial-and-error and the inconsistency of three steps forward and two back. It is a developmental process of integrating different sets of age-related skills under a variety of circumstances and conditions. Like all independent developmental skills, potty success fluctuates over time. Eventually, all the developmental components come together and you can take success for granted (most of the time). Unlike other independent skills, potty training often has added public pressure. Oh no – what if your child isn’t potty-ready to start preschool? Or, what if your child is the last one in diapers? Are you potty training too late? Too soon? Are rewards good or bad? Will your child need therapy if you do this wrong? Stress and pressure seem to surround potty training yet it’s that stress that undermines potty success. •	If a child is struggling because some essential readiness components aren’t there, he learns he is not good enough. •	If a child’s fears are dismissed as nothing, he learns to distrust his feelings. •	If a child is belittled for accidents, he learns to give up. •	If a child feels too much pressure, he learns to exert control in negative ways. Potty training is only partially within a parent’s “control”. Parents support and guide. They set the tone. Inevitably, the child must step up and take “control” of his or her body and his or her world. Potty training is for the child a complex, multi-faceted set of readiness factors. The convergence of skills is unique and personal to each child. The most important readiness skill for successful potty training is physical control. Your child’s body sets the timing on physical readiness, i.e. your child can stay dry for at least 2 hours. Parents help support this physical awareness and control by helping the child understand the body-potty connection – recognizing the need to potty before peeing or pooping and holding the pee or poop to release in the potty. Until the child has muscle control, there’s no rushing this skill. Of course, disposable diapers camouflage potty sensations by whisking away discomfort and creating a warm, comfy barrier around bottoms. That’s why naked time can facilitate awareness and control. Busy schedules can also distract children’s attention from the inner workings of their bodies onto the excitement of external activities. It helps to slow-n-simplify activities when potty training is under way. 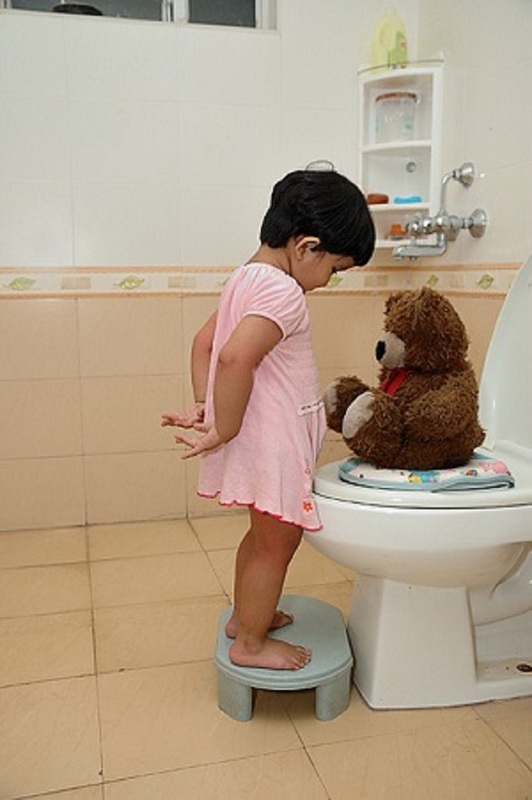 Young potty learners also need to be committed to the success of potty training, i.e. emotional readiness. Parents cannot create the desire for a child’s to stop playing to run to the bathroom or to speak up when it’s potty time. Parents may create helpful routines and make potty learning a positive adventure (like finding the bathrooms at the mall) but parents cannot be insistent in the face of resistance. Parents want to stay out of power struggles and focus forward: every child WILL learn to use the potty eventually. Emotional struggles only delay success. Parents are practicing “letting go” at the same time children are learning how and when to “let go”. What can parents expect? Each child learns to use the potty in their way on their own time. Some will “learn” in a day because they are eager to be independent and they can predict and control their bodies. Some will slowly tiptoe into this new adventure with supportive encouragement. A few other children will need to do it their way and only their way. It isn’t wrong for a child to take months to become independent and confident. The wise parent adjusts to each child’s personal style and ability. Parents are there to create opportunities for success – like a critical potty reminder or a practice potty weekend at home. They will be there to answer questions both spoken and unspoken – from “where does the poop go” to “it hurts when poop isn’t allowed to come out”. Parents teach problem solving – how to speak up in a classroom or how to try again after an accident or a painful poop. Children need parents to guide them through the most physically and emotionally complex time of their lives thus far. Potty training is a parenting milestone as well as a developmental one. Parents are learning how to lead without overwhelming or overstepping, how to cultivate responsibility and independence in someone else, and how to remain positive through frustration, doubt and uncertainty. The good news is: all children become proficient potty-goers. And parents learn invaluable lessons about themselves and their child.